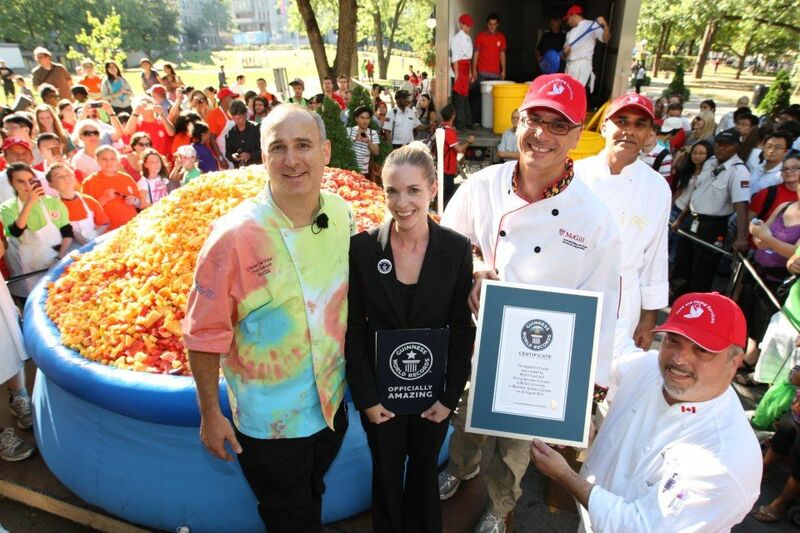 It’s official: The McGill community is the creator of the biggest fruit salad in world history — the Guinness records people can vouch for it. It weighs in at 11,197 pounds. After hours of chopping, slicing, and dicing, at the end of the day the 250 volunteers from across campus looked tired but excited. 5,000 pounds of watermelon, 1,300 pounds of cantaloupe, 1,000 pounds of honeydew, 2,250 pounds of pineapple, 220 pounds of apples and 360 pounds of strawberries, among other fruits, all went into a gigantic salad hosted in a colourful “pool”. More than 50 per cent of the fruit has been harvested from McGill’s own Macdonald campus and over 60 per cent of the final result has been given to local charity organizations. We mingled with the crowd and sampled a bowl of this famous salad.